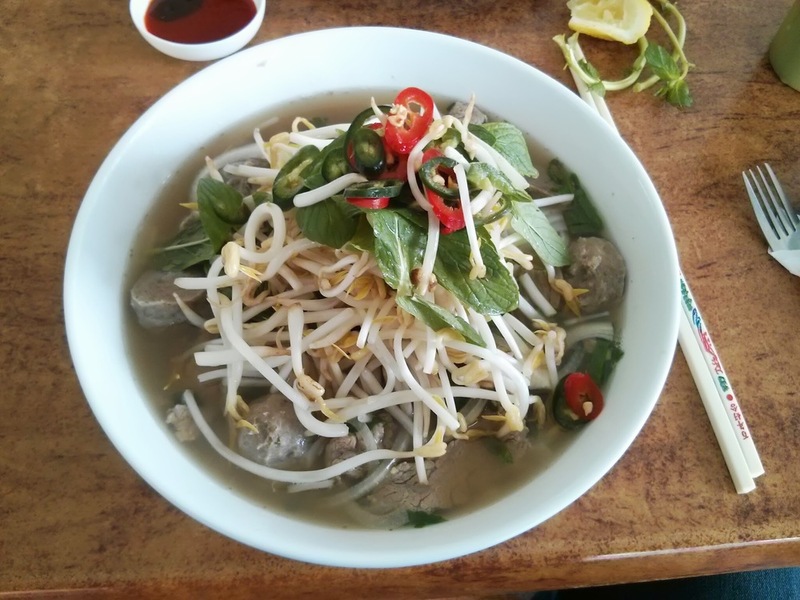 It was with great scepticism that we set off to Caddy's Lunch Bar for a Vietnamese lunch, how could a lunch bar, let alone one named Caddy's serve up a top quality pho? It felt weird bypassing the formerly Pavarotti priced Vietnamese eatery Mama Tran's to venture further north on Milligan St to Caddy's Lunch Bar. It's very easy to miss the Vietnamese delicacies on offer, as there is no mention of them on the chalk menu boards. The only indication being some small A4 signs taped to the window. At $9.50, it's the cheapest pho we've come across in the Perth CBD. All doubts about authenticity were removed upon ordering as a nice Vietnamese lady took our order. Yes, we were guilty of some racial stereotyping! We took our seats in the dated dining area, there were plenty of empty seats around with the majority of the punters eating the standard lunch bar offerings. We were brought out a generous plate of the usual pho accompaniments - bean sprouts, mint, lemon wedges & sliced chilli. A request for extra chilli was also granted at no extra charge. As well as this, a bottle of our favourite rooster brand Sriracha Chilli Sauce and some Hoisin sauce was offered to compliment our meal. The Pho was brought out piping hot! There is something so comforting about eating a hot bowl of pho in cold weather, especially with the rain bucketing down outside. The broth itself was packed full of flavour with the largest portion of noodles I've come across in any pho in Perth. There was an abundance of beef balls and meat, and although the meat was thickly sliced and slightly overcooked, it was surprisingly still tender and tasty. To emphasise the large serving sizes, none of us could completely 'bottom out', which is absolutely unheard of amongst The Pavarotti members. Whilst it may not be the trendiest venue, the pho was packed with good flavour and they didn't skimp on any ingredients. It's not the best pho in the CBD, but then none of the others fall into the Pavarotti price range. We'll definitely be back, if not for the pho, for the broken rice that looks like it could be a winner as well. Do you know of any other Pavarotti priced Pho's? Let us know in the comment section below.